Easy Oven-Baked Chicken Fajita recipe is an explosion of deliciousness. It’s perfect with a side of rice, in a wrap, and the chicken is the perfect topper for your salad. It’s time for the Summer version of “The Freaky Friday” blog hop, and I’m bringing an Easy Oven-Baked Chicken Fajita recipe to the party! The Freaky Friday blog hop is a group of bloggers that are secretly assigned each others’ blogs from which we choose a recipe. It is so much fun, and the bloggers that participate are all amazing foodies. The biggest problem I always have is picking just one recipe to post about. This time I had the pleasure of being assigned Dini’s blog The Flavor Bender. I’ve known Dini for about as long as I’ve been blogging. I can’t even begin to tell you how talented she is and what an amazing friend she is to so many people including me! Dini refers to herself as the mad-scientist behind the Flavor Bender where she combines flavors in new and wildly creative ways that will make you fall in love with cooking and baking! That is exactly the way I would describe her! Just look at her Galaxy Cocktails! I wanted to make her Self Saucing Chocolate Pudding Cake with Strawberry and Bourbon recipe but didn’t trust myself not to eat the whole thing. So, I made her Easy Oven-Baked Chicken Fajita recipe. What drew me to this recipe is that it was baked and there were so many ways that I could think to serve it. 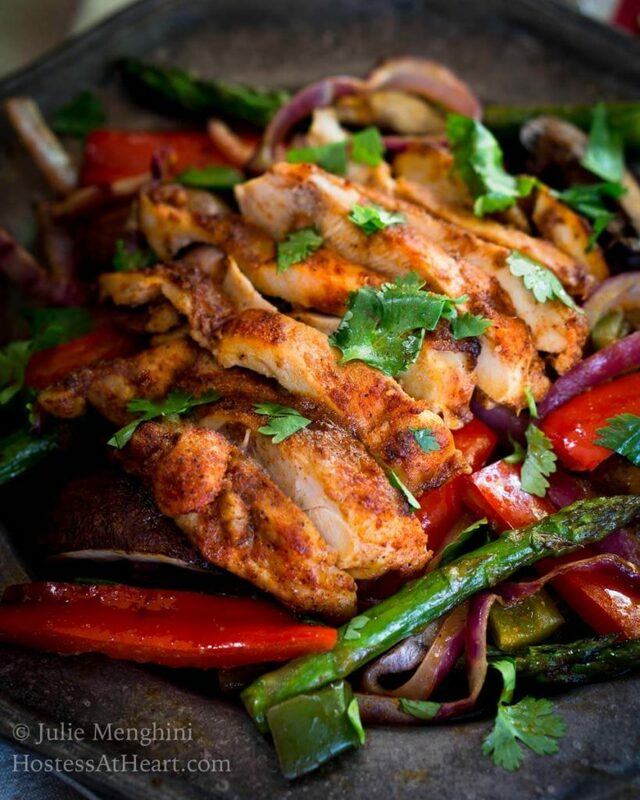 I can’t wait to try to make a new version of my Chipotle Grilled Chicken Salad using her Fajita seasoning! Easy Oven-Baked Chicken Fajita recipe is an explosion of deliciousness. It's perfect with a side of rice, in a wrap, and the chicken is the perfect topper for your salad. Combine the ingredients for the Fajita seasoning. 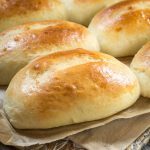 Make extra for other recipes down the road! Mix the Fajita seasoning with all of the marinade ingredients except for the chicken. Pat the chicken pieces dry. Place them in a dish large enough to immerse the chicken in the marinade. Refrigerate for at least 2 hours or up to 24 hours. Preheat oven to 350°F. Cover a rimmed baking sheet with foil and spray it with non-stick cooking spray. Place chicken skin side up in a single row on a cooking sheet and pour marinade over the chicken. Bake for 30 minutes or until chicken registers 165°F with a thermometer. Cover with foil if skin gets to dark. Remove chicken to a dish, cover and allow to rest. 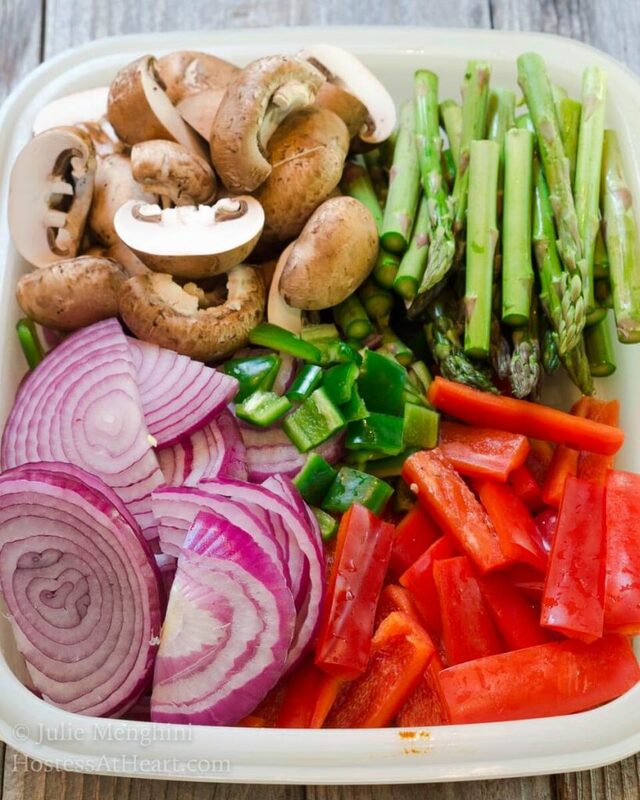 Place vegetables on the same pan in remaining marinade. Bake for 20 minutes or until just al dente, stirring after 10 minutes to redistribute in the marinade. Prep time doesn't include marinating time. The original recipe doesn't include mushrooms or asparagus. Use the vegetable combination of your choice. Chicken can also be grilled. The only change that I made was that I used boneless skinless chicken thighs and drumsticks and threw in a few extra veggies. Her Fajita seasoning mix is phenomenal! John loved his fajita in a tortilla and I loved it as is. Once the veggies were gone, I put that amazing chicken on a salad for lunch. This Easy Oven-Baked Chicken Fajita recipe is going to become a regular in my kitchen! Just go see for yourself all of the amazing recipes on The Flavor Bender. I’ll guarantee you’ll want to stay a while. While you’re at it, take a look at what these other Freaky Friday participants are cooking up! Oh my goodness, your chicken looks so mouth-watering and perfectly cooked. I love how its all done in one pan. Thank you Lily! It was so quick and easy that it makes a great recipe for a busy day. Dini certainly has some amazing recipes! I love how complex her flavors are yet her recipes are easy to make. This too is one of my favorites because I love fajitas an the fact that it is one pan! You’re right Jennifer, Dini has so many amazing recipes. She’s a kitchen magician! We really loved this recipe. Her fajita seasoning is so good. I loved being able to cook it all in one pan too! 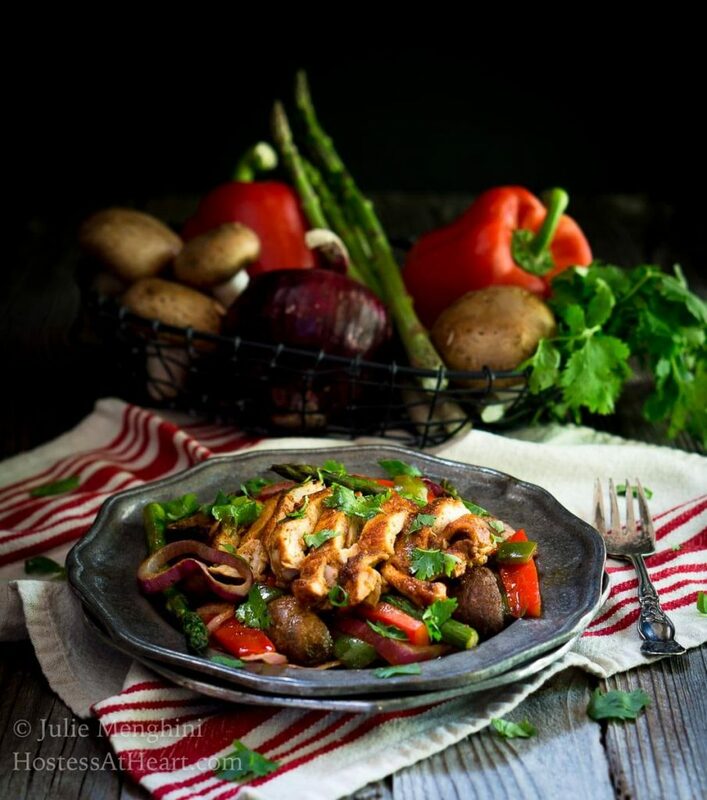 Love the bright bold colors in this dish Julie. I love it when a recipe beckons me in, and this certainly does that. One tray, one bake, I like that, you’re spending less time in the kitchen and more time on the patio with that glass of vino ha ha! Thank you Loretta! I loved this chicken on a salad and will be making it regularly too. Of course, everything is better with a glass of vino! 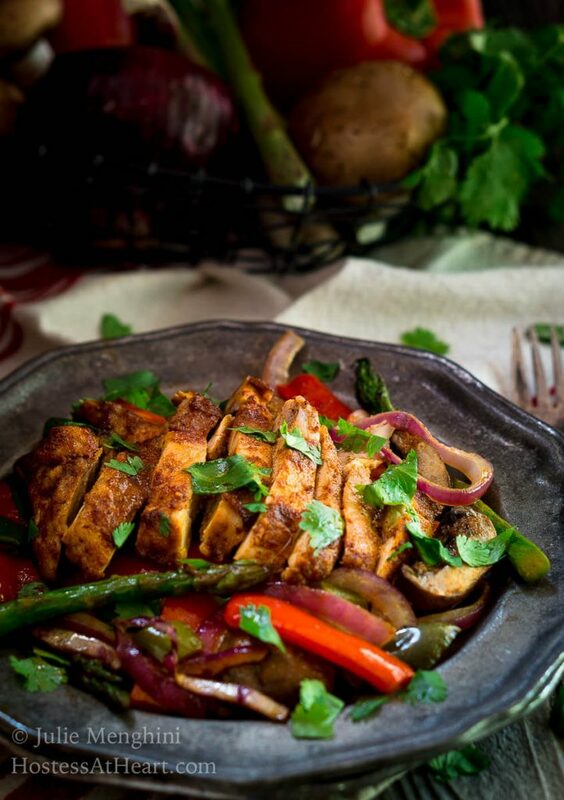 Dini, we just loved this recipe and that fajita seasoning is amazing! I had a heck of a time deciding which recipe to make. You are definitely a master of the culinary arts! What gorgeous photos!!! 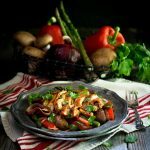 This recipe has me craving fajitas!! I can’t wait to try these! Michaela, I just loved everything on Freaky Friday and am so appreciative of the work you put into it. The worst part is deciding which recipe to make! We loved this recipe so much, it’s so quick and easy. 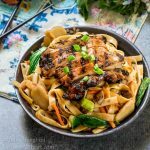 This looks so delicious, Julie, and would be perfect for meal prep, too! I’ve got a house full of fajitas lovers so we will have to try this! Thank you Ashlyn! 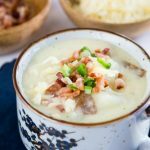 I really enjoyed this recipe and it really was quick and delicious! Your fajitias look so tempting!!! I love making fajitas in the oven, as a matter of fact they might go on the menu for this week! Thank you, Lori! We sure enjoyed them. Dini’s fajita seasoning is so good! What a versatile recipe, I love all of the suggestions for serving this delicious chicken! I can’t wait to give it a try I know we will love it!! Thank you Debra! I’ll definitely be making it regularly. We really enjoyed it! That looks delicious! Definitely a recipe my family will like! Thank you, Michelle! It’s quick and easy too. 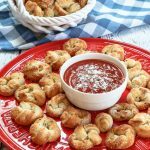 Dini’s recipes are amazing – you picked a great one! Your pictures are lovely. Thank you, Jenny! The hardest part of Freaky Friday is picking one recipe, and this one is definitely a keeper! Oh my gosh, Julie (and Dini) this chicken looks amazing! The pics are stunning and now I’m famished :). Hope you’re having a great weekend! Thank you, Kelsie! Hope you are staying cool my friend! Thank you, Kalyan! I really appreciate you stopping by and leaving a sweet comment on my photos! This looks fantastic and your pix are beautiful! Oh, you picked a great meal! My family will love this recipe and I like how easy it comes together! Thank you, Sandra! We loved this recipe. Will definitely be trying these soon. We love Mexican food! Thank you Candi! We loved them. Fajitas are one of our FAVORITES! These look delicious. TOTALLY trying! That seasoning of Dini’s is amazing! I hope you love them as much as we did. These fajitas look so tasty! Thank you Pamela! We loved them. Look at all those gorgeous veggies! What an easy weeknight meal that certainly doesn’t sacrifice on flavor! Cant wait to try this! Thank you, Angela! I really love my veggies too. These fajitas look and sound perfect! Thank you Nicole! We loved them. Look at all those colors! You know it’s going to taste amazing! Thank you, Christie. It was a simple but delicious and healthy dish. 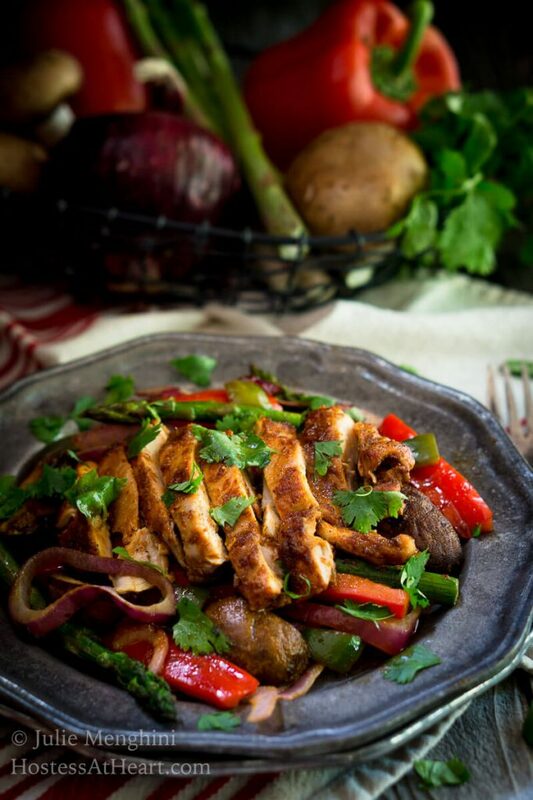 I’m loving the flavor and ease of this beautifully photographed fajita recipe! Our kids are huge fans of the stuff and I this will be going on our family menu pronto; thanks for the beautiful work! Thank you so much, Dan! It’s definitely a great healthy balanced dish for those growing kiddos! These fajitas are seriously gorgeous and you can just tell from the photos how flavorful they are!! Thank you so much! They were so good and once the veggies were gone I enjoyed the chicken on my lunch salad. I’ll make more next time! It is lunch time and I am looking at this going “Gimme some” This looks sooo yummy!!! Thank youy Deanna! This recipe is definitely a keeper! This sounds so delicious and your photos make it look absolutely mouthwatering! I also love the mix of veggies you used. Thank you, Lisa! It was so good. This will be my new go to Fajita seasoning. This is so doable! Cant wait to make it…. just put everything on my grocery list! Thank you!!! I hope you love it as much as we did. Next time I’m making more! I love this idea… baking fajitas…. also the idea of making another blogger’s creation. Its fun to see how other poeple put together their ideas. I also have a recipe I may sub in the fajita seasoning on! Thank you Michele! I loved this seasoning and will be making a lot of it next time I put it together. That chicken was so quick and easy and perfect for salads too. Julie that looks delicious a great recipe from Dini! I love how simple it is and a tray bake of chicken snd veggies is always a favorite. Thank you Suzanne. This chicken comes out so delicious that I’m making a ton of it for salads next time. Stay cool my friend! Thank you Marisa! I was really pleased with how they came out too.